The "Swim" concept shows a smooth upper body and the raw 3D-printed look at the bottom. Apparently you can have it either way or a mix of the two. 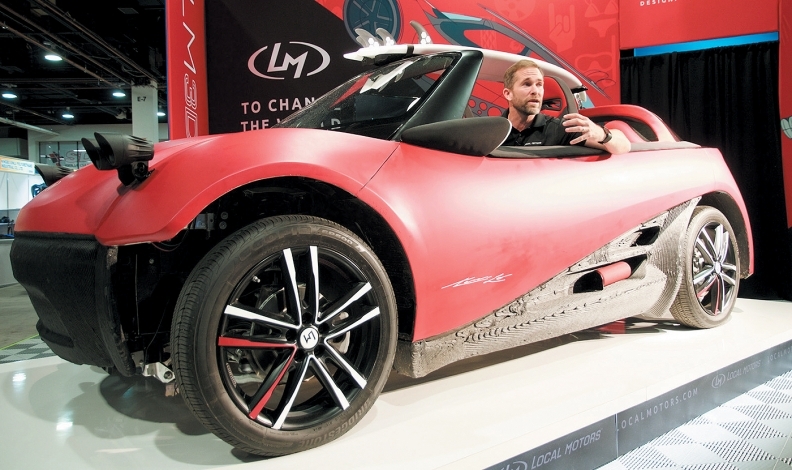 Local Motors CEO Jay Rogers is at the wheel. There's no question that 3-D printing has a place in the future production of automobiles. But how extensive will that role be, and how will it be achieved? Those questions are being aggressively pursued by the industry and by academic researchers working with the industry. Mass-produced 3-D-printed cars are still years away, if they ever become reality, but some vehicle parts such as interior trim pieces are already being produced using the process. The main current application for 3-D printing in automotive is in the development of prototypes, says the director of McMaster University's Automotive Research and Technology department in Hamilton, Ont. Prof. Mo Elbestawi says 3-D printing in the prototype stage allows for the use of novel designs, new materials and minimal inventories, and is significantly less costly and time intensive than traditional methods of prototype production. "It allows the use of the same materials to be used in the final product, thus allowing more realistic testing of that product," says Elbestawi. Chrysler castings engineer Tom Sorovetz concurs. At the Chrysler Technology Center at Fiat Chrysler Automobiles (FCA) U.S. headquarters in Auburn Hills, Mich., 11 3-D printers are currently operating under Sorovetz's watchful eye. At the tech centre last year, Sorovetz met an engineer who was tasked with verifying how well the internal oil lubrication system was working inside the rear axles of Ram pickup trucks and Jeep Wranglers. The engineers lamented how difficult it was to determine what was going on in there; cutting holes into the housing and peering in with a flashlight was about his only option. Sorovetz then offered to 3-D print an axle housing out of a clear plastic. "This shows how 3-D printing benefits the testing and validation process, which is really out-of-the-box thinking," says Eric Mayne, FCA's media relations manager for engineering. "The initial vision of 3-D printing revolved around a finished product, but when you realize it has enough flexibility to use it in this way, I think that is significant." 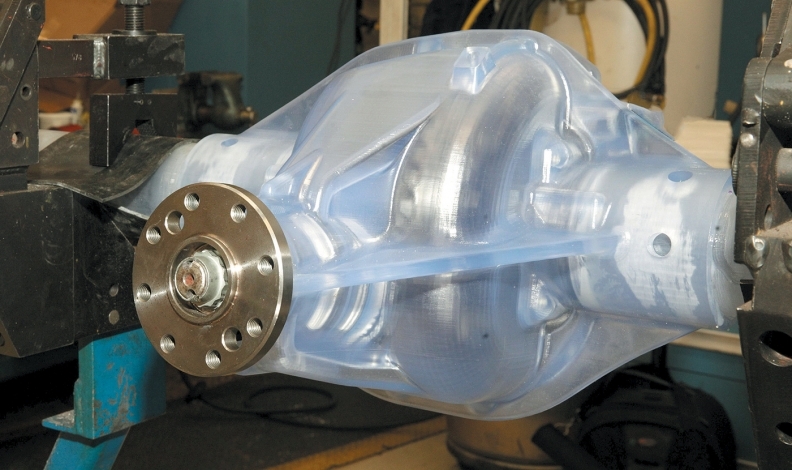 To actually see what's going inside the rear-axle housing of a Dodge Ram, Fiat Chrysler made a 3-D printed clear case. McMaster researchers believe 3-D applications will expand to the making of dies and tooling, and eventually to actual production itself, and are engaged in active research on those fronts. Is Chrysler also looking at possible 3-D applications beyond prototyping and testing? Mayne was not at liberty to say, calling such information proprietary. Production times are an issue. 3-D printers can produce components, Elbestawi said, but take time as each layer of material is applied to produce the final product. Current 3-D printing applications include various components made of aluminum and steel alloys, titanium, composites, and polymers, but Elbestawi notes there are more options and ideas that need pursuing for automotive, such as the development of new materials (like biomaterials), multi-material 3-D printing, and the use of nano technology to improve the performance of printed components. McMaster is working with a number of automakers on these and related topics. By combining new design concepts with advances in material science and engineering, advanced laser and control technologies, Elbestawi believes 3-D printing will make "significant" advances in automotive production. There is, of course, already one company using the technology for automotive purposes: Arizona-based Local Motors, famous for printing the complete body of a vehicle on site at various trade shows. At the 2016 Specialty Equipment Market Association (SEMA) show in Las Vegas, Nev., the company revealed the LM3-D Swim, which it billed as "the world's first 3-D-printed car series." All cars in the series will be built at a new Local Motors microfactory in Knoxville, Tenn. The microfactory manufacturing model is a core element of the initiative. In a way, the business model is just as radical as the manufacturing process: small local factories would build and then sell vehicles directly to customers. "We're not interested in building a competitor to the Camrys and Accords and selling tens of millions of sedans in the next few years," said Local Motors spokesman Adam Kress. "We are firmly focused on identifying niches that traditional automakers could never consider, because their vehicle runs would be so small that they could never turn a profit."